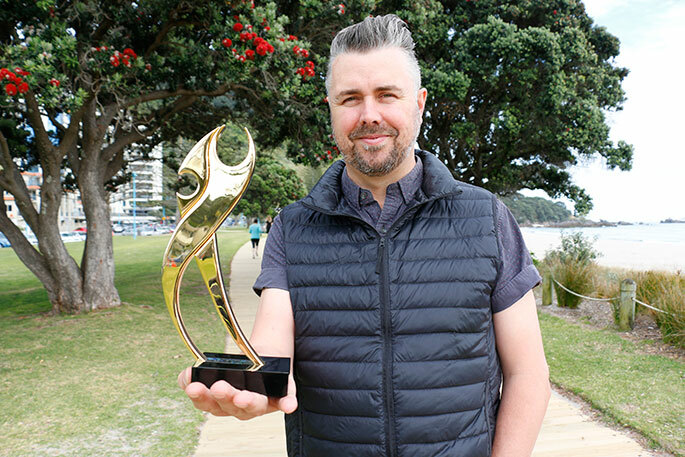 Tauranga member of LIFE Worship Tony Crawford with the New Zealand Music Award the band won for Best Christian Album. Kiwi band LIFE Worship battled cancer, a botched vocal cord operation, a breakdown, and a car crash on the journey to record their award-winning album ‘Through the Fire’. After recording their first album, the band started working on songs for their second. “We hit a few speed bumps in the journey,” says Tony. A botched operation left Tony unable to talk, other than to “grunt like Chewbacca”. “I lost my voice completely for eight months.” Shortly afterwards, vocal director Rhiannon Peters was diagnosed with cancer. She and Tony were in hospital at the same time. “I couldn’t talk and she couldn’t walk,” says Tony. But they continued with plans for their new album. Fellow band member Geneva Wilson takes up the story of how the journey was interrupted by the health issues of her husband, the band’s drummer. “He ended up having a ‘full blown manic episode’,” says Geneva. So, now LIFE Worship had a singer who couldn’t sing, a drummer who couldn’t drum, a vocal director still recovering from cancer, and another performer supporting her husband. “It was like everything had gone on hold,” says Tony. However, towards the end of 2013 things were moving again. “We were all coming right, we’d all improved a lot more, and then Jono had his car crash.” A driver crossed the centre-line, and crashed head on with Geneva and Jono’s car, leaving Jono in a coma. The doctors may not have hope, but the band had prayers, and, they believe, they were answered. Tony’s voice came back, Jono recovered, and Rhiannon is in remission. For more information on the band and their journey, visit lifeworship.org.nz, or look for ‘Through the Fire Documentary’ on YouTube.